What is a Chakra Balance with Kinesiology? Using Kinesiology to balance the chakra’s means we can use muscle testing (the body’s own biomechanical feedback system) to establish accurately which chakras are out of balance. The Chakras are one of the energy systems within the body associated with the flow of life force, or Chi. There are 7 main Chakras, each with its own position, vibration, colour, and sound. 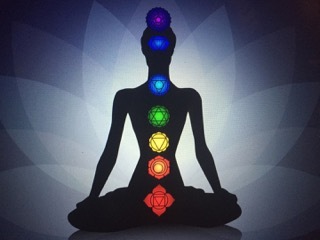 With the Kinesiology test we test more than just the main 7 chakras, enabling us to work deeply with the Chakra system. You will have the choice of using crystals or energetically charged glass nuggets in your treatment. What can I expect from a Chakra Balance with Kinesiology? The first part of the treatment consists of asking and answering questions around your situation and health, in a short consultation. Once you are then on the couch, Rebecca will perform a series of ‘pre-check’ tests to ensure your body and brain are talking to each other effectively. Rebecca will then asses each of the chakras individually using muscle testing to establish which of the chakras are out of balance. Once this is done Rebecca will bring them all back into alignment using either crystals or energetically charged glass nuggets, depending on the clients preferred method. These are then laid directly onto the client while Rebecca works on the energy, building it back into alignment.